A nice overview of Trench T, from Hugo’s kite cam, showing the potential new revetment wall in the new extension at the top of the photo. A new group of volunteers and students arrived on site today, many of them old faces from previous years, but all clearly excited at the prospect of another season on the Ness. 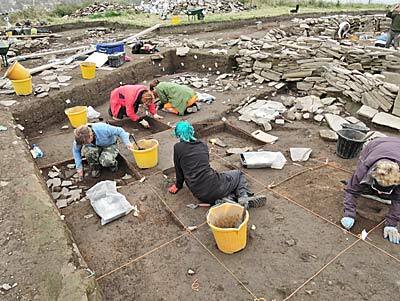 Existing numbers were down a little because the Willamettes are visiting the island of Rousay and the remarkable sites there in the company of county archaeologist (and Rousay resident) Julie Gibson. More good news on the work front came from Owain, who has decided to stay for another couple of weeks. This is particularly gratifying because of the excellent job he has been doing in the central midden area around the “central” standing stone. Strictly speaking, he should be burrowing deeper into the later Neolithic pottery of Shetland, and elsewhere, for his PhD thesis at Edinburgh University. But if you don’t tell his supervisors, we won’t. And further good news came in the shape of Sarah, a long-time Structure Ten supervisor, whose arrival today has been sadly delayed by her inconsiderate sister, who decided to get married last week. Bribes and threats failed to move her, and she even refused to blink at Sarah’s proposal to hold a trowel instead of flowers for the wedding photographs. Quadranting in the central midden continues apace. To site director Nick’s considerable relief, she is now back where she belongs in Structure Ten, supervising the removal of the floor deposits. Another arrival on site today was the remarkable Tony Sherratt, the living archaeology specialist. Tony set up his tent and proceeded to demonstrate many of the creative activities which would have been carried out at the Ness in the Neolithic. Today, he was demonstrating rope making from long strands of plant material to the many visitors on site. The twisting technique which makes the rope so strong is not an easy thing to learn, but once mastered can be used in remarkable ways. He can make 1.5 metres of rope in as little as three minutes, and it is strong stuff. A small basket took just 20 minutes, and that includes the time to make the rope from which the basket is woven. In Structure One, the floor deposits are becoming gradually untangled. Jenny and Chris carefully plan the area around the central standing stone, which is in the foreground. They are also turning out to be even more complex than expected, but this is not too surprising as all the other structures also feature horribly complex floor deposits. 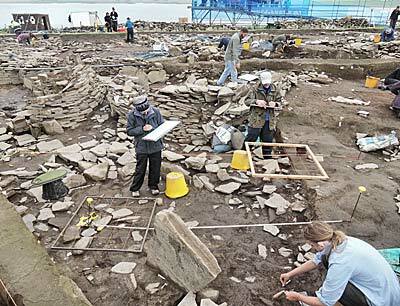 Further over in the central midden area, the Wheeler quadrants are proving their worth by enabling a growing understanding of the material between Structures Eight and Twelve, including the elusive Structure Twenty-Three, which was first hinted at as a reused wall under the annexe of Structure Twelve. 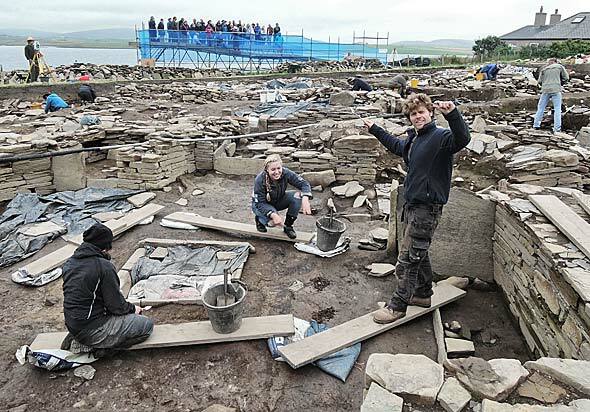 Not far away, Chris and Jenny are planning (detailed drawing) the central midden area and in Structure Ten Claire and Jan are continuing to unveil the area around the entrance. It is good to see Ingrid Mainland resume her Smart Fauna project, which examines the exact nature of the massive bone deposit around Structure Ten. 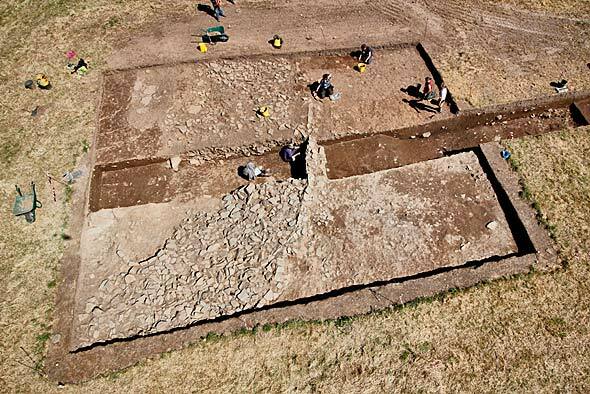 Those who would like more information on this fascinating project can find it in a paper published by the Journal of Archaeological Science earlier this year. This can usually be accessed online. Ingrid’s only problem is that she has just two weeks to complete this section of the work, which involves a sondage adjacent to the one she used two years ago. After that, a well-earned family holiday beckons. Trench T, the massive new-ish trench on the far side of the house of Lochview is gradually giving up its secrets. Another wall has appeared, parallel to the main outer revetment but this time facing downhill as could have been expected. At the bottom of the trench the team are very close to the natural surface but, as ever, there are complications looming. These will have to wait until later, perhaps tomorrow. Dan orchestrates the removal of floor deposits in Structure One. 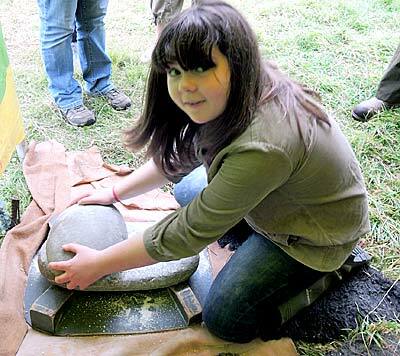 Hi my name is Alice, I have just finished my degree with UHI and am hoping to continue on to my MSc in September. This is my third year digging at the Ness and this year I am digging in the central midden area which is between Structure Twelve and Structure Eight. So far, we have had an interesting time trying to figure out context layers, which has resulted in the area being sectioned up into metre squares which is an exciting technique to be using, and interesting to see how each square relates to the other and the differences in finds. With five of us in the section, it can be a bit cramped, but we have managed to achieve a lot this past week and have gone down a fair way in some sections. We have also had a number of small finds such as foreign stone, flint and pottery, but always have the hope of finding something extraordinary the further down we get! Really enjoying being in this section this year as we are never quite sure what is going to happen next and looking forward to what the next four weeks have in store!